As corporate scandals unfold one after the other, one sector that is doing well these days caters to recently convicted CEOs. There are actually consultants and lawyers whose specialty is making incarceration a little easier for white-collar criminals. If your nose is clean, you might find it kind of funny -- at least satirist Andy Borowitz does. 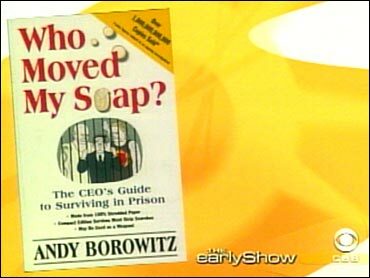 His latest book, "Who Moved My Soap? The CEO's Guide To Surviving In Prison," takes a tongue-in-cheek look at the matter. A take-off on "Who Moved My Cheese," a corporate pageturner, Borowitz tells The Early Show co-anchor Harry Smith his new book is more helpful if you broke enough laws to go to prison; it aims at helping you cope with your new environment. Borowitz explains the lead character is "a CEO who was the chairman of a company called Shamco. It was an energy telecom pharmaceutical company. They created an alternative to Viagra called Hornamax that didn't work too well. So he finds himself behind bars and is trying to make the most of it. What I point out in the book is when you are a CEO, who is behind bars, you're just trading one gated community for another." In fact, he sees going to prison as a business opportunity. Borowitz says, "He follows a code that's in the book, which is seven habits of highly effective prisoners. The most important one of these is be pro-active. Don't let prison riots do damage to you. Start the prison riots yourself on your own terms, on your own schedule." So the message is that people who are in this situation shouldn't be afraid of going to prison. The author notes, "They're trading in their pin stripes for horizontal ones. It is really about making their new environment comfortable. I have a chapter on prison cell Feng Shui, which is very important to create a prison cell that maximizes chi, or energy, a very uncluttered environment. I had the first Zagat guide to prison dining in there, the five top spots - prisons- in terms of the dining experience." He adds CEOs can manipulate their way to a better prison. Borowitz says, "Sam Waksal is the first one" as he pulls a card out of his pocket, he says, "He is the three of diamonds, by the way, very important to keep track of that. Sam Waksal wanted to go Eggland, which has been considered sort of a country club prison. I think the conditions are pretty tough. They are limited to five wire transfers to their Swiss bank accounts a month." So now it is the time for readers to laugh at the CEOs. Borowitz says, in this instance, it is fair to do so: "Millions of us lost money with Tyco, Worldcom, Global Crossing, Adelphia, Enron. You just can go on. So this is the first time we've gotten a chance to laugh. That's the reason I wrote "Who Moved My Soap" because we can laugh instead of crying about it." "As a recently convicted CEO, you, too, are probably wondering what prison is really like -- and you may also be wondering what makes me such an authority on the subject. Sure, I've told you that I'm writing this from prison, but you're probably not picturing me in a prison. I'll bet you think I'm at one of those so called "country club" prisons like the legendary "Club Fed," sipping from a tumbler of Chivas while I lazily dictate this book to some high-priced ghostwriter like Norman Mailer or Joan Didion or whomever wrote Charles Barkley's book. You're probably picturing a place where the harshest punishment is having your DSL service cut off for the afternoon and where the prisoners only riot when the mess hall runs out of Beluga. Well, permit me to drop a bomb on you: For the past six months, I've been doing time at the United States Penitentiary in Lomax, Alabama, a maximum security facility that Consumer Reports has consistently rated "America's Worst Place to be Locked Up In." ...Believe me, there's no golf course at Lomax, and when someone picks up a club, you run like hell. And riots? Last week we had a real barnburner that erupted when two prisoners got into an argument over who played the character Screech in "Saved By the Bell..."